Alaska adventure travel, points of interest and destinations. 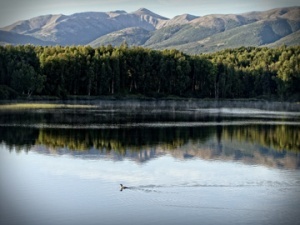 A great early morning shot from our fly-in remote lake cabin in southcentral Alaska. We are so fortunate to call Alaska our summer home. Since attending college in Fairbanks, Alaska in the late 1990’s (Jason), Alaska has been one of my primary home bases. My good friend Cory and I purchased a full-service remote fishing lodge following graduation and that has become our main “career” focus ever since. Sondra has since joined in on the adventure and we both now spend each May through early September split between the lodge, Anchorage, our vacation rental properties and many spaces in between. If you haven’t been, you must go. Not only is Alaska filled with a super-natural landscape, but also offers great food, tradition, culture and people. They say ‘curiosity makes the child go wander.” If this is your calling, Alaska may be the best North American destination for you. Most life-long Alaskans are unable to even scratch the surface when it comes to exploring this expansive and diverse Frontier. Be it by road, trail, horse, float plane, boat, kayak or bike, there are endless opportunities for you to get lost in Alaska. We are happy to share a few of our favorite spots on the map. Hopefully what we share can possibly entice you to visit one of the last great places on earth. What’s holding you up?